Romtec Utilities designs, engineers, and manufactures pump stations as complete packages, including some equipment that improves the operation of the system. Davit cranes are one option that can be included with many pump stations and offer several benefits to both owners and operators of the system. Lifting devices are necessary to carry out several operations, including routine pump inspections and emergency repairs. Romtec Utilities often recommends installing davit cranes alongside pump stations to always have a lifting device ready and available on-site. Davit cranes, also known as jib cranes, are useful tools for both pump station ease of use and for safety. These cranes are designed for lifting over ledges or into openings, making them perfect for pump station maintenance operations. Submersible pumps are heavy pieces of equipment that typically need to be lifted with a crane for personnel to perform visual inspections, maintenance, and repairs. Operational valves and other equipment will also need to be lifted on occasion. Purchasing and installing a davit crane as a permanent feature alongside a pump station can be a great advantage for municipalities and personnel without access to truck mounted cranes. Public utility districts and municipalities often have operating procedures in place that dictate how frequently pump inspections and other preventative maintenance operations are carried out. This will typically involve the pumps being lifted from the wet well. Depending on the size of the service area and the number of pump stations in operation, the availability of service trucks with cranes may be limited. Waiting for a truck crane to be available may not always be ideal, especially when emergency repairs need to be carried out. In some applications, davit cranes will be a requirement due to trucks not being able to visit the site. Providing a reliable lifting device onsite is the best way to promote safe lifting practices for personnel. When there is no crane available for personnel to use, there may be a temptation to lift pumps by hand. This is a safety risk that can lead to fatal accidents. Even with more than one person lifting the pumps, these are heavy pieces of equipment and personnel can throw their backs out or drop the pumps back into the well breaking them. There is a large risk of personnel being dragged into the wet well while holding onto the chain while attempting to lift pumps by hand and becoming trapped in an enclosed space. The best way to ensure that safe lifting practices are used is to include a permanent crane onsite and strip away the temptation to lift by hand entirely. There are many styles and options available for davit cranes to meet the specific requirements of each project, including intrinsically safe configurations and corrosion resistant coatings. 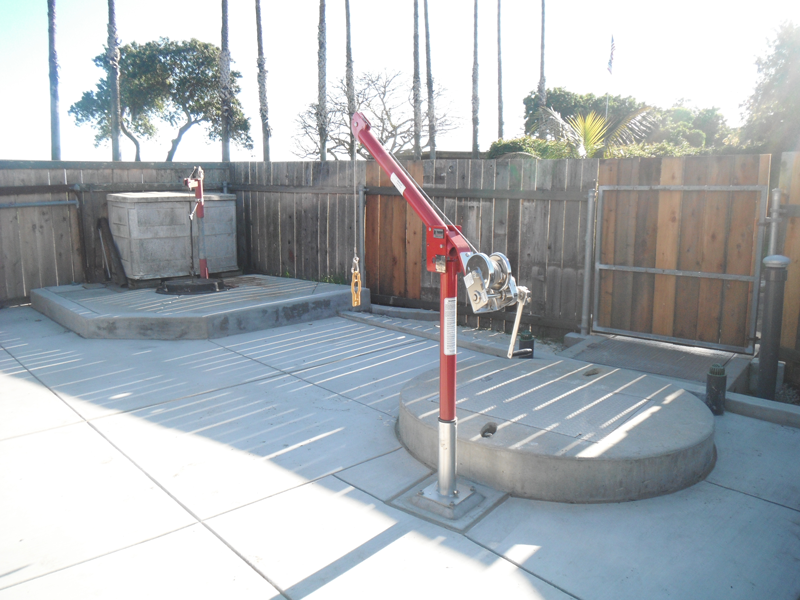 Romtec Utilities will often recommend installing davit cranes as a permanent feature alongside pump stations when the location allows it. Maintenance operations can be performed safely and efficiently when a reliable means for lifting pumps and other heavy equipment for troubleshooting and inspections is available. Call Romtec Utilities today for more information on how a davit crane can improve your pump station project!